Audi had a nice OLED-based lighting installation at their booth at CES. They used 124 OLED panels (about 7x7 cm each) to form the Audi logo. Those OLEDs are red in color, probably as this is the standard backlight color for EU and US cars. The installation is a moving 3D one, and the Audi rings are formed from all sides, which makes it look a bit weird in the photo. Audi has been mostly collaborating with Philips on OLED lighting, which leads me to believe that the red OLEDs used in this installation are made by Philips, but they also showed some designs in the past using OSRAM-made OLEDs. In the past Audi demonstrated several OLED lighting prototypes. In 2012 they unveiled three OLED designs, including the rear-mounted "swarm" which uses tiny OLED lighting panels to create a beautiful large display. 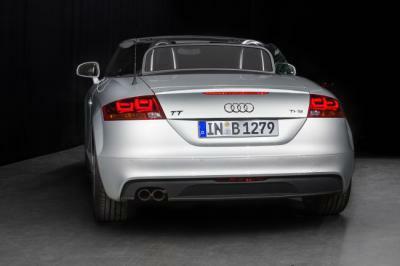 In 2013, Audi (in collaboration with Philips, Automotive Lighting, Merck and the University of Cologne) developed the world's first large-area 3D OLED car rear lighting panels and installed a prototype on an Audi TT. 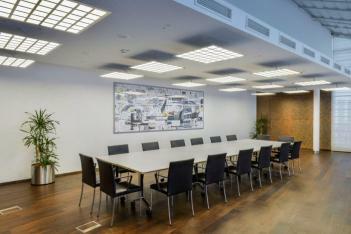 In June 2013, Audi installed a new OLED installation in a high-level conference room (used for internal and external meetings) in their HQ at Ingolstadt. The installation includes 15 OLED luminaires, each containing 36 Philips Lumiblade GL350 OLED panels - in total there are 540 OLED panels and the total lumens count is almost 58,000.